We will understand the concept of Hough Tranform. We will see how to use it detect lines in an image. 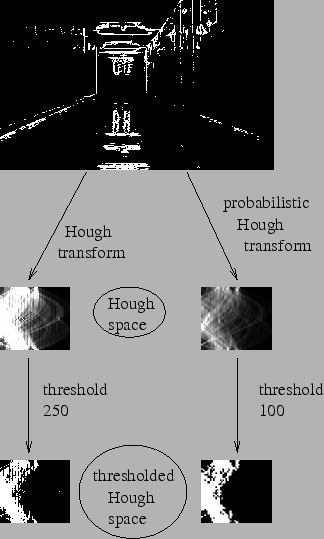 Hough Transform is a popular technique to detect any shape, if you can represent that shape in mathematical form. It can detect the shape even if it is broken or distorted a little bit. We will see how it works for a line. So if line is passing below the origin, it will have a positive rho and angle less than 180. If it is going above the origin, instead of taking angle greater than 180, angle is taken less than 180, and rho is taken negative. Any vertical line will have 0 degree and horizontal lines will have 90 degree. Now let’s see how Hough Transform works for lines. Any line can be represented in these two terms, . So first it creates a 2D array or accumulator (to hold values of two parameters) and it is set to 0 initially. Let rows denote the and columns denote the . Size of array depends on the accuracy you need. Suppose you want the accuracy of angles to be 1 degree, you need 180 columns. For , the maximum distance possible is the diagonal length of the image. 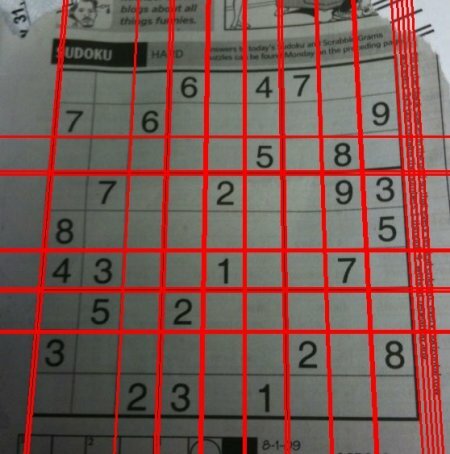 So taking one pixel accuracy, number of rows can be diagonal length of the image. Consider a 100x100 image with a horizontal line at the middle. Take the first point of the line. You know its (x,y) values. Now in the line equation, put the values and check the you get. For every pair, you increment value by one in our accumulator in its corresponding cells. So now in accumulator, the cell (50,90) = 1 along with some other cells. Everything explained above is encapsulated in the OpenCV function, cv2.HoughLines(). It simply returns an array of values. is measured in pixels and is measured in radians. First parameter, Input image should be a binary image, so apply threshold or use canny edge detection before finding applying hough transform. Second and third parameters are and accuracies respectively. Fourth argument is the threshold , which means minimum vote it should get for it to be considered as a line. Remember, number of votes depend upon number of points on the line. So it represents the minimum length of line that should be detected. OpenCV implementation is based on Robust Detection of Lines Using the Progressive Probabilistic Hough Transform by Matas, J. and Galambos, C. and Kittler, J.V.. The function used is cv2.HoughLinesP(). It has two new arguments. minLineLength - Minimum length of line. Line segments shorter than this are rejected. maxLineGap - Maximum allowed gap between line segments to treat them as single line. Best thing is that, it directly returns the two endpoints of lines. 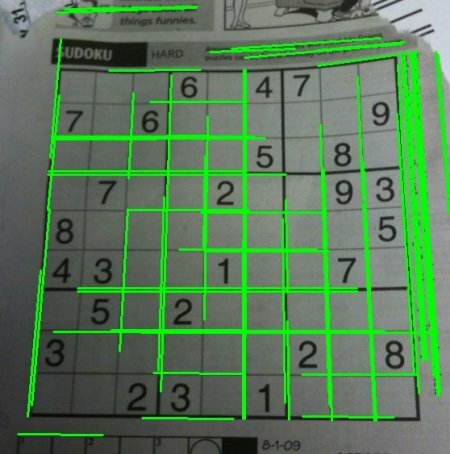 In previous case, you got only the parameters of lines, and you had to find all the points. Here, everything is direct and simple.